Cover of ISU’s copy of De Agricultura Vulgare. In this month’s Rare Books Highlights post, we’ll be taking a look at the oldest agricultural book we currently own in Special Collections. It is Pietro de’Crescenzi’s De agricultura vulgare, published in 1511. With that publication date, it just misses the incunabula period, or the first 50 years of printing, but it still has many features of an early printed book. This book is an Italian translation of a much earlier work, Ruralia Commoda, a standard agricultural manual first written circa 1305. 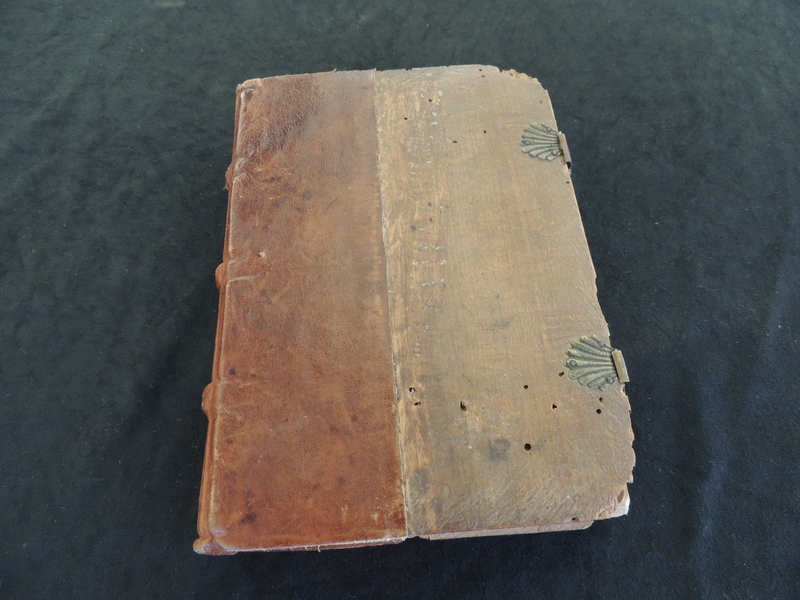 Let’s start by taking a look at the book’s interesting binding. It is quarter-bound leather over wood boards, which means that leather is used to cover the spine only, and the wooden boards are exposed. It also has some clasps with lovely seashell-shaped catches. The boards have seen some wear–look at those chewed up corners! It also is peppered with wormholes. (That’s right–bookworms are a real thing and include a number of beetles that, in their larval state, will tunnel through wood and paper.) Based on the style, I’m guessing this is the original binding. One of the things I love about this book are the wonderful woodcut illustrations throughout the pages. They show images of herding families, animals in some sort of corral structure with a man praying to God, a group of men threshing grain, and even what looks like a herdsman playing an old instrument resembling bagpipes! I love these illustrations for their simple depictions of medieval life and clothing. This book has a colophon, which is a statement at the end of the book with information about the book’s printing. This one gives the place of publication (“Venetiis”–Venice) and publication date (“die sexto mesis Septebris anno dn̄i M.D.XI.”–September 6, 1511). No publisher is listed here, even though that information was often included. A colophon was a feature that carried over into early printed books from manuscripts, where scribes would often write a message to the reader. Early in the 16th century, colophons gave way to the title page. This book is clearly from the transition period. It also has a title page, but it is very basic, listing only the author and title. This book is Pietro de’ Crescenzi. De agricultura vulgare. Venice, 1511. Call number: S492 C863d. This entry was posted in Rare Books and tagged Agriculture, rare books. Bookmark the permalink.